So you’ve got that new family tree software you spotted on the shelf in PC World or on Amazon, and now you want to start tracing your family tree. Genealogy research is made so much easier with database software, so you’ve certainly made the right step. The next step is to marry the family tree software with a useful data resource. This might be notes, photographs, a few birth certificates or newspaper cuttings, or it might be a much larger data resource such as census results, passenger lists from emigration/immigration projects or even military records. But how do you use this data? And more to the point, how does taking the time to enter it into your family tree software actually help? The point of a family tree application such as Family Tree Maker (just one from a selection of many) is to allow you to enter information about ancestors and relatives into your family tree and update it as and when you find new information. These applications all feature reporting tools that collate the data, noting the relationships that you specify between members and these reports can illustrate the size and depth of your family. For instance you might wish to print a family tree to display on a wall in your house; family tree software can create such illustrations. All of the information is editable; if you discover that your grandfather avoided national service by joining the Red Cross, you can edit the record to reflect this. But where does this information come from? 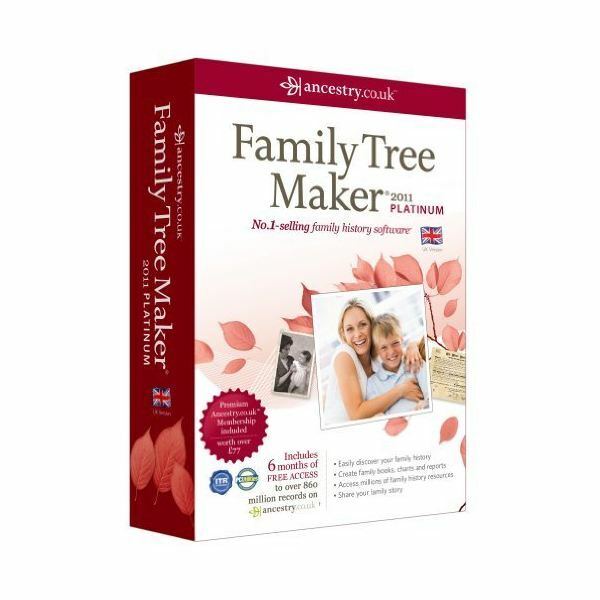 Family Tree Maker in particular is affiliated with the website www.ancestry.com (which also has various international versions such as www.ancestry.co.uk and www.ancestry.com.au) – this means that the extensive databases and libraries available through these websites are integrated into the application. A good way to get started with Family Tree Maker is to enter the name and date of birth of a grandparent; you will then have the option to search online for this individual. As you do this, Family Tree Maker connects to the library of databases at www.ancestry.com and looks for a suitable match for your ancestor. This might be a perfect match or a similar match; the aim is to find the relevant records for you to then begin populating your family tree. While we’ve largely focused on Family Tree Maker in this article, there are a number of similar applications available on the market, and they all have roughly the same features. One that has become more popular and important over the last few years is the ability to add media to your family tree. This might be simply images of family members, or it might be scans of newspaper articles. Similarly it might be video or audio clips, and adding these to your family genealogy research can really enrich the experience, not to mention sharing the end product. And sharing is something you should certainly consider, if not online using one of the many file export or conversion options then certainly with relatives!